Steve and I have always had very busy schedules, especially since his job in college ministry in Fayetteville kept him busy at odd hours. This has forced us to get a little creative about finding ways to spend time together. Here are just a few ways that we’ve discovered over the years to stay close. 1. Have at least one meal together every day. This was often lunch for us, since both of our jobs in Fayetteville allowed us to have a flexible lunch and we only lived five minutes from where we worked. We would go home together for lunch and maybe watch a show together if we had time. If one spouse works late or overnight, breakfast could also be a great option, and dinner works well for most families. Since you’re both going to eat several times a day, it’s a no-brainer to eat together at least once! 2. Study dates at a coffee shop. Steve’s still in school and I blog and do graphic design on the computer fairly often, so we both spend quite a lot of time with our laptops. One of the easiest ways to turn that time into time together is to head to a coffee shop and sip hot drinks while we work. It helps us wind down a little and we’re more likely to chat while we’re out somewhere together than at home, where I’m more likely to get up to clean or do laundry or something like that. 3. Use drive time together. We only have one car, so one of the biggest blessings that’s come from that is time that we spend commuting or dropping each other off places. We always know that we get that time together, and while it’s often short, it adds up! And if that’s the only time we happen to spend together that day, it helps to tide us over until we can spend more quality time together. We’ve often used this time to memorize verses or read scripture or fiction books together, too. 4. Do something together before bed. Steve doesn’t usually go to sleep when I do, since he usually has homework or reading to do, but he almost always goes to bed when I do and we read together or watch a show or snuggle till I fall asleep and then he gets back to work. Once again, this isn’t a whole lot of time, but with busy schedules every little bit helps to keep us close. 5. Cook Together. Like I said in #1, we’re both going to eat sometime, so we might as well do it together. One way to get more interaction during a meal is to cook it together. You can double or even triple your time together (depending on how involved the cooking is) and it’s just plain fun (at least for us Kieklaks!). We love making messes and trying new dishes together! 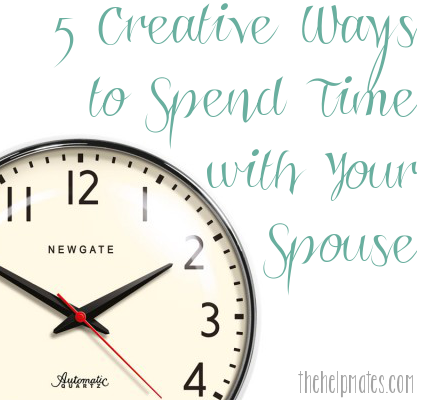 I hope this list has encouraged you to find more little ways to spend time with your spouse! What are some things that you do that aren’t on my list?